(TibetanReview.net, Aug18, 2014) –In a move obviously designed to drive home the point that Tibetans can enjoy a semblance of religious freedom just so long as they strictly adhere to its political delimitation of that freedom, China has allowed a respected elderly Tibetan Buddhist master to teach at his monastery in Nagchu (Chinese: Naqu) County of Tibet Autonomous Region after having arrested him and out casted him from it in 2010. 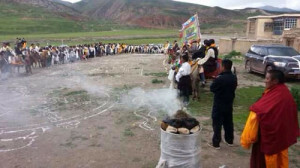 Local Tibetans had for long been pleading with the authorities to allow, 79, to return to Shak Rongpo Gaden Dhargyeling Monastery, located in the county’s Shakchu Township. 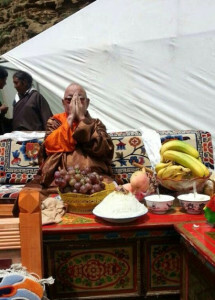 The Lama is believed to be on medical parole after being jailed for seven years in 2010 for colluding with the Dalai Lama, Tibet’s exiled spiritual leader, and arrived at the monastery on Aug 8. Accused of having communicated with the Dalai Lama about the search for the ninth reincarnation of his monastery’s spiritual head, China arrested him on May 17, 2010. The Lama was then stripped of all his positions at the monastery and banned from visiting and maintaining any sort of contact with it. In Jul 2013, China closed down the 300-year-old monastery – along with many others in the area – for an indefinite period of time after its monks fled it to escape official harassment and political education persecution. It is not clear when the monastery was allowed to reopen. Hundreds of local Tibetans greeted the Lama as he returned to the monastery to resume his teaching, according to several reports.